On October 15th people from all over the world will take to the streets and squares. From America to Asia, from Africa to Europe, people are rising up to claim their rights and demand a true democracy. Now it is time for all of us to join in a global non violent protest. The ruling powers work for the benefit of just a few, ignoring the will of the vast majority and the human and environmental price we all have to pay. This intolerable situation must end. United in one voice, we will let politicians, and the financial elites they serve, know it is up to us, the people, to decide our future. We are not goods in the hands of politicians and bankers who do not represent us. 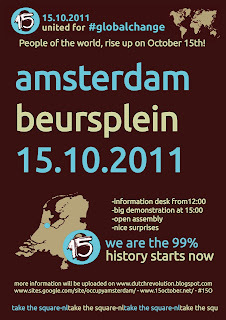 On October 15th, we will meet on the streets to initiate the global change we want. We will peacefully demonstrate, talk and organize until we make it happen. It’s time for us to unite. It’s time for them to listen. Why You don't speek Nederlands ? Dutch ? THANK YOU for the info in English, I (as tons of people I know here in Amsterdam) don´t speak dutch at all.